Rediff.com » Business » Amazing view of China's richest village! China's richest village Huaxi has a new landmark -- a stunning 74-storey International Hotel, rising to a height of 328 meters. It is the 15th highest skyscraper in the world, taller than Eiffel Tower in Paris and New York's Chrysler Building. As Huaxi celebrates its 50th anniversary, this building with an exhibition hall, a revolving restaurant, rooftop swimming pool and gardens is yet another attraction in a village that has caught the world's attention. 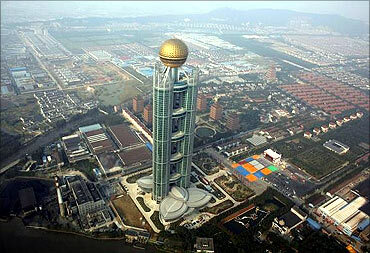 Image: The newly inaugurated skyscraper tower of Huaxi village is seen in Huaxi village. Amazing views of China's richest village! Thanks to Wu Renbao, the former secretary of Huaxi Village Communist Party Committee, this poor village transformed into a rich paradise. About 40 years ago, Wu Renbao, a farmer himself, propelled a movement which saw Huaxi transform itself from an agriculture-driven economy into an industrial powerhouse. 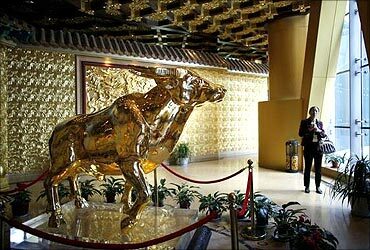 Image: A solid gold bull weighing a tonne also greets visitors at a viewing area on the 60th-floor of the tower. Every house has a car in this village. Mud roads with bullock carts have been replaced by swanky Mercedes and BMW cars. In Huaxi, those from the original 2,000 residents have at least a house, a car, and $250,000 in the bank and enjoy universal health care and free education. 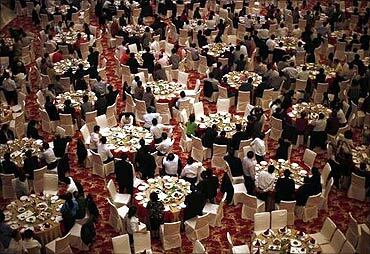 Image: Guests attend a dinner at the new skyscraper tower of Huaxi village before its official inauguration. With the listing of the village's multi-industry company on the stock exchange, farmers became wealthy. The company has bought aeroplanes and plans to buy ships. The villagers are in the company's shareholders and are paid one fifth of the company's annual profits. 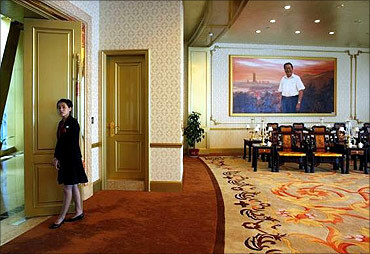 Image: A woman stands at the entrance of a meeting room inside of the new skyscraper tower of Huaxi village. Officials from other parts of China tour Huaxi to find out how this sleepy village with just 576 residents in the 1950s has turned into a prosperous place. Last year, the village bought two helicopters for sightseeing tours. In 2003, Huaxi village became the first village to generate 10 billion yuan ($1.5 billion) of gross domestic product, Xinhua News Agency reported. 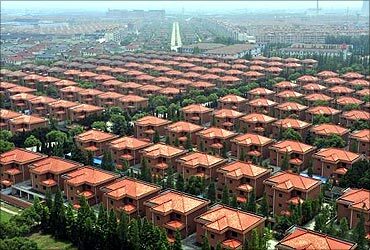 Image: A view of villas built for residents in the Huaxi village of Jiangyin. 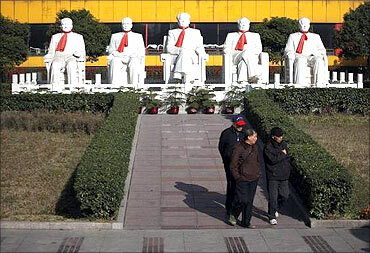 Villagers work seven days a week in Huaxi. The houses and streets are well maintained as well. 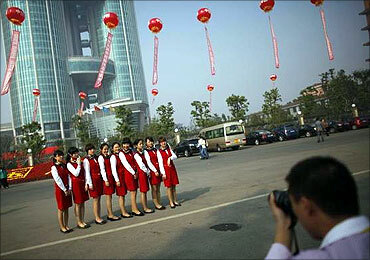 Image: Women pose for a picture in front of the new skyscraper tower of Huaxi village. Huaxi village aims to be as big as other metros like Beijing and Shanghai. 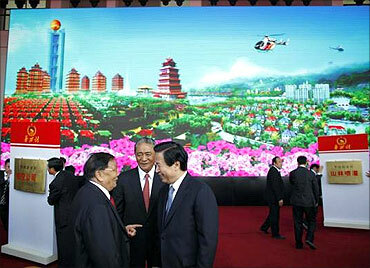 Image: Officials attend the inauguration ceremony of the new skyscraper tower of Huaxi village. 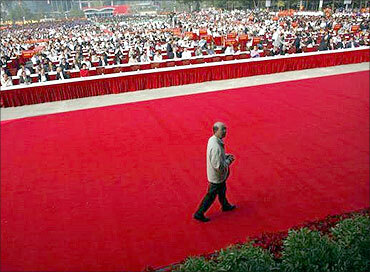 A guest arrives at the inauguration ceremony of the new skyscraper tower of Huaxi village. Image: New skyscraper tower of Huaxi. Dancers prepare to perform at the inauguration ceremony of the new skyscraper tower of Huaxi village. 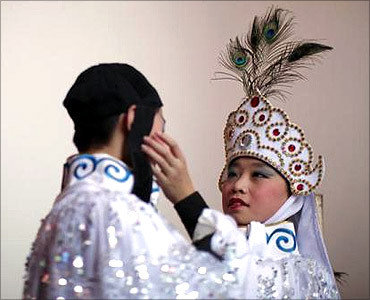 Image: Dancers of Huaxi village. 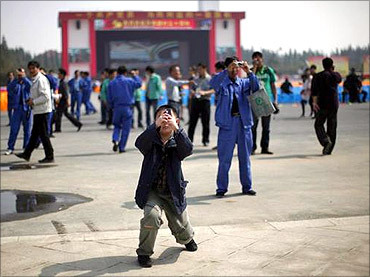 A boy takes pictures of the new skyscraper tower of Huaxi village, in Jiangsu province, October 8, 2011. 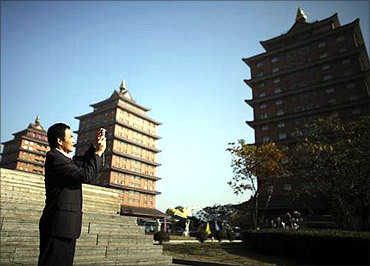 Image: Skyscraper tower of Huaxi village. 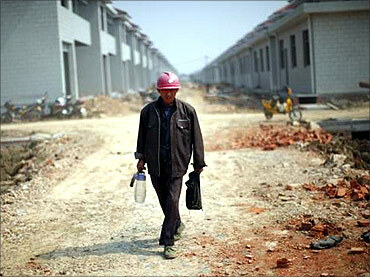 A labourer walks at a construction site for new houses in Huaxi village, Jiangsu province. Image: A labourer walks at a construction site. A man takes pictures in Huaxi village, Jiangsu province. Image: A man takes pictures in Huaxi village. 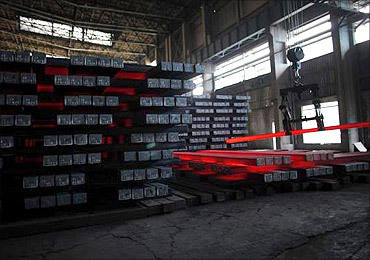 Steel bars are seen at the Huaxi Iron and Company in Huaxi village. Image: Huaxi Iron and Company. 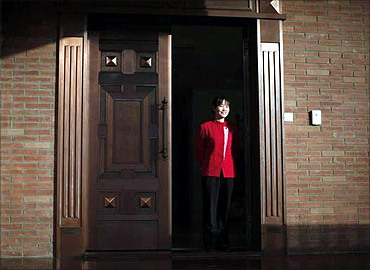 A house employee stands at the door of a new house in Huaxi village, at Jiangsu province. People visit Huaxi village in Jiangsu province.